Southern France and Northern Italy meet for a unique date in a foodie dungeon in Dupont Circle at Urbana Restaurant and Wine Bar. We knew we loved the luxurious lounge that locals have been happy to hunker down in for years, but what took us by big surprise was the food. Urbana has truly upped the ante when it comes to refined flavor and artful presentation. 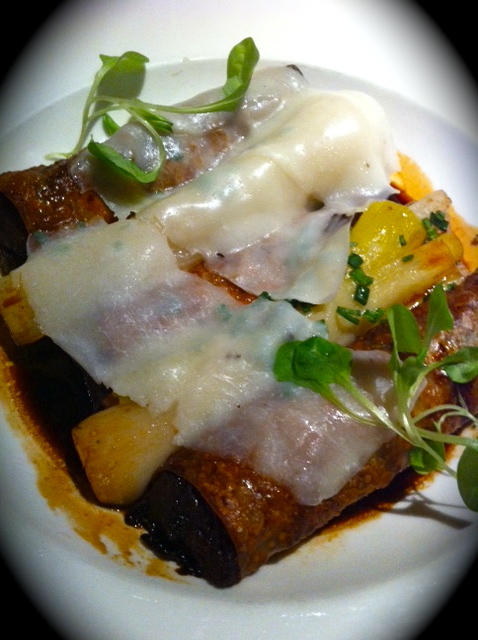 The Best Thing on the Menu: Cannelloni – Rolled Pasta with Red Wine Braised Beef Short Rib, Leeks and Truffled Pecorino is a knock out. The shape of the oversized leeks are a play on the shape of the tubular cannelloni and their pickled, tangy flavor goes perfectly with earthy, tender short ribs. The leg of lamb was a close second, as were many of the other dishes we sampled. We’d love to see Urbana creep up to the upper echelons of cuisine and ratings in DC because they are most worthy. Urbana has been celebrated as one of DC’s best bars for treating regulars like royalty (see DC Eater article). It’s not too often that you find a hotel bar (Kimpton Hotel Palomar) and restaurant as beloved or frequented by locals. Urbana has also been named as one of DC’s hottest restaurant bar scenes. So, next time you’re ready to dine in Dupont, take a turn down the other side of P Street for some great eats. Cannelloni not your BTM? Post your favorites in the comments section.